Ah…the BIG question, and one that we are asked frequently. 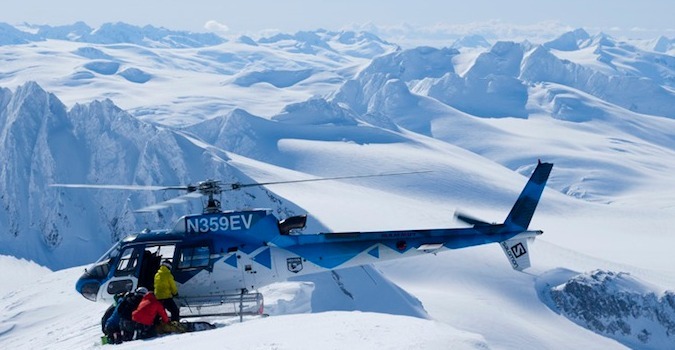 When is the best time to go heli skiing in Alaska? As the heli ski season in Alaska is upon us we thought now was a good time to give you some handy pointers. Alaska – Heli Skiing; when is best to travel? However if (like me) you are a planner at heart and have the benefit of a clear diary then there are obviously some ‘norms’ of what to expect during different parts of the heli skiing season in Alaska. At different times of year the actual heli skiing experience will change slightly depending on when you go to Alaska, so it gives you an opportunity to heli ski at a time in the season that best suits what heli ski trip you are after. The heli ski season in Alaska runs from the start of February to the end of April – it’s a pretty short season, mainly due to the lack of daylight hours early in the year. But, when is the best time to travel to Alaska? Mid-season heli skiing (March/April): Mid-March to mid-April is the most popular time to heli ski in Alaska as the days are longer, giving you more opportunities to heli ski, and the temperatures are still relatively cold with some regular snowfalls expected. So essentially you can strike a balance between daylight, conditions and also stability. End season heli skiing (April): Days are getting even longer and temperatures are warming up so you might not get the lightest, driest powder, but what you do tend to have is more settled weather (which means more heli ski fly time) and a more stable snowpack, which allows you to ski more of the steeps – which is of course what makes Alaska such a special spot for heli skiing. Heli Skiing in Alaska Price Watch: the prices are consistent throughout the season, except for the first two weeks of the season which are about 8% less expensive. If you want to try your hand at heli skiing in Alaska, give the powder skiing experts at Pure Powder a call on +44(0)207 736 8191.